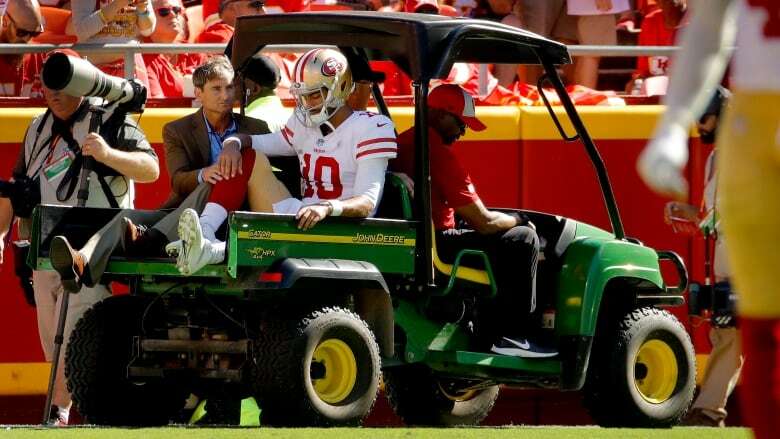 San Francisco 49ers quarterback Jimmy Garoppolo will need season-ending surgery on his injured left knee. Jimmy Garoppolo's addition last season immediately turned around the fortunes of the San Francisco 49ers. Now the 49ers will have to go back to life before Garoppolo for the rest of the season. One quarterback who won't be brought in is former 49ers starter Colin Kaepernick, who opted out of his contract with San Francisco in March 2017 after Shanahan decided he wanted to go with a style of offence that didn't fit Kaepernick's game. "That's what I said last year and it's the same situation now," Shanahan said. "I always look into what style of offence I want to do and what style of offence we've been doing the last two years." Beathard started five games as a rookie last year, completing 54.9 per cent of his passes with four touchdowns, six interceptions, 19 sacks, 6.4 yards per attempt and a 69.2 passer rating that was second lowest in the NFL. Ben Roethlisberger threw for 353 yards and three touchdowns to lead the Pittsburgh Steelers to a 30-27 victory over the Tampa Bay Buccaneers on Monday night. Capping a tumultuous week in which star receiver Antonio Brown made headlines by shouting at an assistant coach on the sidelines and getting into a spat on social media, the Steelers (1-1-1) built a 20-point lead before holding on for their first win. Vance McDonald scored on a 75-yard pass play and finished with four catches for 112 yards. Brown and Ryan Switzer also had first-half TD receptions for Pittsburgh, which led 30-10 at halftime. The Steelers' defense forced four turnovers, including three first-half interceptions of Ryan Fitzpatrick, the 35-year-old journeyman who threw for 819 yards and eight touchdowns in two victories to begin Tampa Bay's season. Fitzpatrick led his team to 17 fourth-quarter points to make it close.